Novello published its very first composition (Op 18, No 3) by Elgar in 1890, the year in which the 30-year-old German, August J. Jaeger from Düsseldorf joined the firm. Seven years into the job, Jaeger wrote: “I am conceited enough to think that I can appreciate a good thing, and see genius in musicians that are not yet dead…”. The two began a formal correspondence, and Elgar soon realised that he had found a friend and ally in Jaeger, who could read and completely understand his music, whose opinion he could trust, who knew when to criticise and when to encourage in order to keep his volatile charge on an even keel. Indeed the 20 years which separate Op 2 from Op 35 (1887-1907) saw Elgar fighting his way through an endless, often seemingly pointless period of musical self-education—dashing up to the Crystal Palace (from Worcester!) to hear works both in rehearsal and in concert—playing his violin in local orchestras—giving music lessons, all in an attempt to earn a living, and composing whatever he felt he had a hope of making it pay, which often it did not. It is well known that during this period, around the turn of the century, with the first performances of Enigma Variations Op 36 and The Dream of Gerontius Op 38 Elgar emerged from relative obscurity into the glare of intense publicity, becoming an established celebrity in a matter of months. Nonetheless, Elgar remained proud of those youthful efforts from the beginning of that long educational climb, of which seven may be found in this compilation. O salutaris hostia (one of five settings) and the three Latin anthems which comprise Op 2 (1887) are the writings of a late Victorian, providing performable material for exceedingly amateur, mainly local Roman Catholic choirs, while the slightly later two part-songs from Op 18 (1889) are aimed to please the rather more advanced members of local glee clubs, and are typical of the many in print and available at that time. It is pleasing for us now, with hindsight, that we can already discern in all of these pieces aspects of the mature Elgar, whom we all know and love. Another vital event—his marriage was soon to take place (1890). Caroline Alice Roberts was seven years his senior, and had answered an advertisement in the local press, offering private piano lessons in 1886. He gained access to her grand house by means of the tradesman’s entrance. Their courtship clearly flourished despite her family’s disapproval of her ever increasing involvement with a man ‘in trade’, inevitably deemed unsuitable for marriage. It was famously her need to prove that she had become hitched to a genius that provided the pressure he ultimately needed to grow as a composer. Within a few years the young couple had managed to travel sufficiently for Elgar, to attend most of Wagner’s operas, as well as to conduct his Overture Froissart Op 19 in a decent concert in Worcester (1890). The score is headed by a quotation from Keats: “When Chivalry lifted up her Head on High.” Thus began Elgar’s period of lengthy ‘Sagas’. These took the form of Oratorio/Cantatae, settings of tales of knights of old, bolstered by liberal helpings of ‘leitmotivs’ to enable the music to assist in the telling of a story. Like Wagner before him, the fine music came rather more easily to Elgar than the delineation of the characters. In King Olaf (1896) there is much music that could be by none other than the composer of The Dream of Gerontius (1899), and throughout the Edwardian period the work remained extremely popular. But, as the cracks began to seem ever more obvious, only a fragment of the final chorus As torrents in summer seemed to stick with the public, reinventing itself as an unaccompanied part-song. Perhaps it was Elgar’s original hope that these few moments of choral singing, with the orchestra silent, might do for King Olaf what a similar passage (Requiem) does for the finale of Verdi’s masterpiece, set for unaccompanied choir and soprano soloist. Returning to his letter to Jaeger of September 1908, Elgar explains why the part-songs of Op 53 are so much more demanding. “I wish you could have heard the Morecambe Choir under Howson four or five years ago: you would then fully appreciate what I had tried to do.” He is referring to time taken out from the composition of The Apostles in 1903 to adjudicate at a festival, which had become a grand event since being founded by Canon C.V. Gorton in 1891. He was the Musical Director at St Lawrence Church, and had engaged a fine choir trainer and conductor in R. G. H. Howson. The Canon soon proved to be a very useful new friend and expert advisor in theological matters pertaining to Elgar’s ongoing work in The Apostles. The couple stayed with Gorton throughout the festival, for which Elgar had contributed yet another part-song, Weary Wind of the West. Howson, who was very much taken with the piece, must have trained and conducted a pretty sensational choir to have inspired such adventurous, not to say difficult music for the performers to be composed some four years later. Trips abroad by now usually meant Italy, and had become useful periods of rest for recharging the batteries of his creative spirit between masterpieces. Thus In the South (Alassio) Op 50 had appeared in 1904 between The Apostles Op 49 and The Kingdom Op 51. 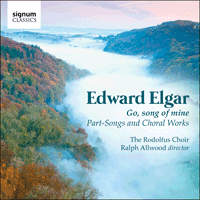 Over the winter, in Rome (1907-8) Elgar produced four part-songs, Op 53. The poem of the first of these is by Tennyson, and he dedicated it to Canon Gorton. It is nothing if not experimental! Since the great Symphony in A flat was already in gestation, it must surely be that this song in eight parts represents a preliminary exploration for what was to become one of the composer’s greatest and most popular works. In the song, the top four parts (ladies) have a key signature of A flat, while the lower four parts (gentlemen) have just one sharp! The Symphony is also in A flat, but at least half of both its outer movements are loosely in D minor (with the entire slow movement in D major). Two more diverse keys (A flat – D) can hardly be imagined. Byron and Shelley both bring out Elgar’s darker, more passionate side. Deep in my soul seems almost orchestral, with its shorter, broken phrases inviting the attention of horns and woodwind, the longer, stretchier lines seem to call for the strings. Shelley’s O wild west wind is equally instrumental in feel, tremendously energetic, almost fierce, not unlike the atmosphere of the wildest moments in the D minor section of the A flat symphony’s first movement. The fourth and last piece Owls is a scary, sinister nightmare. Elgar wrote the text himself, and an explanation too in his letter: “As to Owls—it is only a fantasy, and means nothing. It is in wood (sic) at night evidently, and the recurring ‘Nothing’ is only an ‘owlish’ sound.” By comparison Go, song of mine, though heart-felt, is more conventional in style. Op 57 was also composed in Rome during May 1909. Jaeger had resigned his position at Novello the previous year so Elgar was well aware of his declining health, and he died on May 18th. We do not know for certain whether Op 57 was composed before or after that date, but it must surely have been the first of Elgar’s compositions in almost ten years not to have been scrutinised and ‘passed’ by Jaeger. In the preface to the Coronation Service Book of 22nd June 1901, Walter G. Alcock wrote: “O Hearken Thou, exhibits in every line that spirited intensity so characteristic of the composer…the impression given by the work is so exactly what it ought to be—a reverent supplication.” As the offertory, after the Coronation itself and before the Communion Service, it forms a prayerful interlude, although then of only half its current length. In 1911, it stopped at the words ‘I make my prayer’. Elgar’s Give unto the Lord Op 74, a setting of Psalm 29, gains its power and strength from its quasi sonata-form structure. The occasion was a service in St Paul’s Cathedral on 30th April 1914 for the ‘Festival for the Sons of the Clergy’. Its central ‘development’ section (Allegro moderato) takes care of verses three to eight. Curiously, the Psalm’s first verse is rejected, so that the exposition and recapitulation correspond to verses two and the last verse respectively, with a beautiful coda over an E flat tonic pedal to round things off. He was already working on the five part-songs Opp 71, 72 and 73 during the spring of that year when the troubles in Ireland concerned him greatly, but there is little evidence to suggest that the catastrophe of a world war declared in August was yet an issue. The two poems by Henry Vaughan (Op 71) The Shower and The Fountain are untroubled and gentle. As Elgar only set the final stanza of The Shower, the first word had to be altered from ‘Yet’ to ‘Cloud’ in order for the verse to make independent sense. Were it not for a charming coda (Meno mosso) reserved for the last four lines of The Fountain, with a hint of those ‘orchestral’ effects leading up to ‘The music of her tears’, one might have felt tempted to ignore Op 71! The remaining three part-songs comprising Opp 72 and 73 are settings of poems by Apollon Maikov in translations by Rosa Newmarch. These Russian texts draw from Elgar’s darker and more dramatic ‘orchestral’ effects, reminding us rather more of Op 53. Death on the Hills is marked ‘Quasi alla marcia’—quite clearly a dead march. In a letter to his friend, the organist of Worcester Cathedral, Ivor Atkins, he quips: “It is, I declare, courageous of you to frighten your people into singing Death on the Hills!” Love’s Tempest (Op 73, No 1) alternates between ‘Adagio’ and ‘Allegro con Fuoco’. For a brief moment or two we might be revisiting Shelley’s O Wild West Wind. Indeed, we might just as well be in a wood – evidently at night—in Op 73, No 2 Serenade, but there are no ‘owls’ this time, rather “just bare trees, which toss their arms and weep”; as they do, some three years later so evocatively in the slow movement of the piano quintet (1917). The Great War did not entirely silence Elgar. As well as the chamber music, there was still the sublime ‘cello concerto to come. It was the decline and death of Alice in 1918 that silenced him. However, not completely! The end of the whole story can be read in a publication of the year 2000 by Kevin Allen, “Elgar in Love: Vera Hockman and the Third Symphony”. But all that came too late for the final two pieces in this compilation. The most recent composition presented here is a carol I sing the birth dated 1928 with words by Ben Johnson, in which Elgar demonstrates that he is quite capable of keeping up with the times. Much of it is sung by voices in unison, or if preferred, solo voices, frequently intercepted by ‘Alleluia’ in three voice parts, leaving very little for the full choir to contribute. Yet it would make a suitable companion for Holst’s Lullay my liking (1919), or even Jesus Christ the apple tree (1967) by Elizabeth Poston.